The seeds of this epic battle between Stirling Moss and the entire Ferrari team were sown in the decision, announced at the end of 1958, to reduce the maximum allowable engine capacity for Formula One cars from 2500cc to just 1500 for the 1961 season. Ferrari, who already had a suitable Formula Two car running in 1960, concentrated all their energies on developing a powerful V6 engine to power it. By contrast, the British constructors, who had vigorously opposed the reduction in engine capacity, had no suitable power unit available and were forced to rely on an outdated 4 cylinder design from Coventry-Climax. The twisty Monaco circuit, though, would give the under-powered British cars a chance. Stirling Moss took pole in his Rob Walker entered Lotus 18 (an updated 1960's model) with Richie Ginther alongside in the more powerful 120 degree engined Ferrari. Jim Clark in his works Lotus 21 filled the remaining place on the front row of the grid. Phil Hill and Wolfgang Von Trips' Ferraris lined up fifth and sixth respectively in the slightly less powerful 60 degree engined cars. Richie Ginther led away followed by Clark and Moss. Clark soon retired and it was left to Moss alone to take the fight to the more powerful cars from Maranello. On lap 14, Moss took the lead and started to pull away. As Richie Ginther tired a little, it was the Ferrari of Phil Hill that took up the chase, and Moss managed to extend his lead to some ten seconds. The clock watch told the story as this epic battle unfolded. 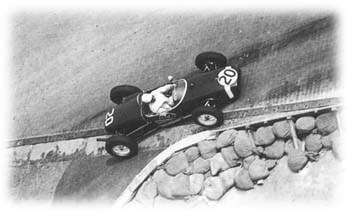 Moss would lose around one second each lap as his Lotus climbed the hill to the Casino square, only to regain the time around the Mirabeau and station corners. As the race passed the half distance point, Ginther appeared to get his second wind and he re-took second place from his teammate Hill. Gradually the two Ferraris closed the gap so that by the 85th lap (of 100) Moss only led by some three seconds. Gradually it dawned on the spectators that a miracle would indeed take place, for Moss, using knife edge judgement when lapping back-markers, somehow managed to resist the Ferrari pressure and eventually crossed the line some 3 seconds to the good from Ginther's Ferrari after some 2 hours and 45 minutes of on the limit driving. Phil Hill finished third with Von Trips fourth. Later that same year at that other ultimate test of driving skill - the old 170 corner Nurburgring - Stirling Moss would once again triumph over engine power, the only interruptions to an otherwise European clean sweep by those wonderful shark-nosed Ferraris. 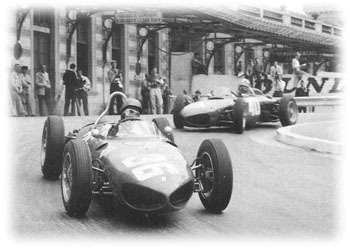 But at Monaco in 1961, in racing terms, David really did slay Goliath. Some races deserve to remain as all time classics for the purely on-track action. Some, like this Grand Prix, because it would see the dawn of a new era that would transform the Formula One racing scene for so long. The new 3 litre engine formula was in its second year, and Lotus had struggled through so far with an enlarged version of their previous Coventry-Climax 1500 CC engine and the troublesome and hugely overweight BRM H16 unit. This race would see the introduction of the Lotus 49, powered by the Ford-financed Cosworth built V8 DFV engine. The Car would not only win on debut, but it would set a new standard for all new Grand Prix cars for years to come. The Cosworth DFV engine would go on to win no less than 155 Formula One races, the last being the victory by Michele Alboreto's Tyrrell 011 on June 5th 1983, and it was the introduction of this ground-breaking new engine that would make this race so significant. Graham Hill carried out the initial testing of the new car and he was able to put it on pole position ahead of Dan Gurney in his Eagle and Jack Brabham driving a car carrying his own name. Jim Clark, who had only seen the car for the first time in practice, was back on the third row of the grid. Hill led from the start and looked to be in total control until the new engine failed at the end of the 10th lap. 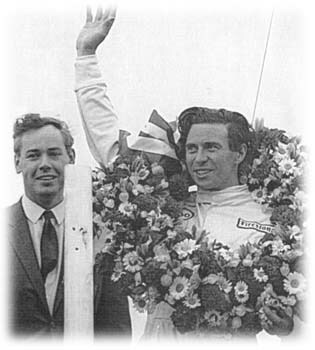 The relief of the rival teams was short-lived as Clark was soon able to power his way to the lead and win a comfortable victory ahead of the reigning world champion Jack Brabham. At a stroke all the other cars had been made obsolete, and although reliability problems would prevent either of the Lotus drivers from winning the championship in '67, the Cosworth engine - which was made available to other teams from the '68 season onwards - would continue to set the standard for a decade to come. The availability of a relatively cheap and competitive engine allowed Grand Prix racing to flourish for a generation, and it was only the arrival of the turbo engines in the late seventies that brought about its eventual demise. Roger Horton © 1999 Kaizar.Com, Incorporated.